Touch for Health uses the muscle test as a biofeedback tool to assess the state of energy in the acupuncture meridian system and provides a variety of techniques for balancing this energy for reducing pain and stress while enhancing balance and wellness. 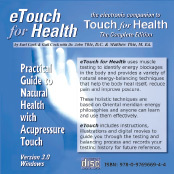 These software apps work in conjunction with eTouch providing additional advanced techniques related to Touch for Health and Energy Kinesiology. The Expansion Apps are from leaders in the Energy Kinesiology field such as Dr. Sheldon Deal and Donna Eden. Additional apps are from eTouch developers, Earl & Gail Cook. This apps can parrallel with eTouch and installed into eTouch. Touch for Health can be practiced almost anywhere and at any time. 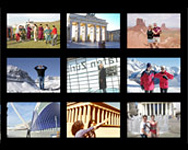 Balancing the World is a Photolog of people from around the world conducting a TFH in front of natural and manmade monuments of the World. Atlanta - NYC - Mongolia - Spain - New Zealand - Germany - Canada - France - Morroco - China - Venezuela - Russia and more. Send us your photo! Touch for Health is an alternative and complementary model of wellness and healthcare. Importantly, it is non-diagnostic model and not used for the diagnosis or treatment of disease or serious conditions. TFH is focused on the many everyday issues of our life that focus on Wellness, Personal Growth, Health Maintenance, Prevention, Stress Relief and Pain Control. 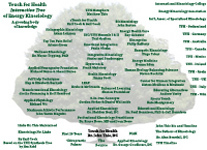 The Interactive Tree of Touch for Health is a clickable menu for accessing many related modalities that are built upon Touch for Health or have grown parallel to the TFH model. Many of the TFH organizations around the world are also linked from the Interactive Tree. At the base of the tree are the founding pioneers and principles of TFH/AK/EK with links to historical recaps. Dr. John Thie was author and founder of Touch for Health. 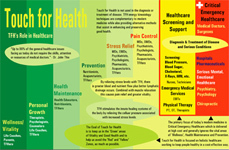 TFH has served as the foundation of many modalities as seen in the Interactive Tree of TFH. Dr. Thie practiced and taught TFH from 1973 - 2005. At 6'5" tall, he had an impressive presence and with his deep voice and charismatic personality, he helped many people find better health and wellness around the world. Touch for Health events are held around the world. We will list major conferences and events of which we are aware. Have a conference or event and don't see it listed, please contact us with dates, location, themes, photos, registration links, etc. and we will be happy to list it for the Touch for Health Community around the world. 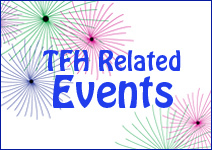 Support your TFH community... attend conferences! eTouch is a complete system for learning, teaching and practicing Touch for Health. There are three primary references: the content of Touch for Health - the complete edition by John Thie and Matthew Thie in a searchable reference; complete TFH muscle reference with movies of the muscles tests and balancing techinques; and the charts and illustrations section is a digital reference of the primary wall charts and illustrations from the book. Personal records are combined with a powerful session system that allows recording of results and production of sophisticated reports. Dona Eden, author and innovator of Energy Medicine, presents her Daily Energy Routine techniques in this Expansion App. Whether you want to de-stress, perk up, or just feel more grounded, you’ll find lots of great techniques designed to help you get ready for the day ahead. Earl traces the fourteen meridians in a Tai Chi style dance to music. On-screen directions accompany each meridian. Great for Instructors, students and presenters! 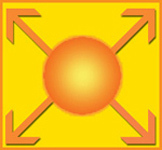 Dr. Sheldon Deal, one of the pioneers in the energy kinesiology field, presents five advanced techniques in this Expansion App. These techniques serve as an introduction to his popular online training course entitled, AK Shortcuts. This app is based on a technique discovered by Earl Cook. It can be used as a powerful full-body one-point balancing technique or used to balance individual muscles. Features Tibetan Monks from the Drepung Loesling Monastery, Atlanta, Georgia. Touch for Health and eTouch for Health are not used for the diagnosis or treatment of disease. For all life-threatening issues and continuing or worsening symptoms, always seek professional health care. Copyright © Laser Solutions, Inc. All rights reserved.